This is a slightly cleaned up version of how nearly every Army story I’ve ever heard starts, but in this case it happens to be true. I was in Pueblo with my wife last weekend to visit her great aunt. After lunch, they decided they wanted to stop by Roselawn Cemetery to look in on their relatives laid to rest there. As the family has been in town for several generations, rather a lot of them are buried there. As we drove through the entrance to the cemetery, I saw two old cannon on the left side of the car. “Oh, that’s the Civil War section of the cemetery,” my wife’s great aunt said. I took note of the remark, but being a good husband I stayed with the group and we duly checked on various deceased family members. On the way out I resolved to stop – just for a minute – and take a couple pictures of the cannon. I didn’t recognize them, and thought they might make an interesting question for Craig Swain over at To The Sound of the Guns. So I parked the car, hopped out, and strolled over to the cannon with my camera. I looked the cannon over, then spied an veteran’s headstone behind them. Curious, I walked over to it. It marked the grave of a former member of the 122d Illinois Infantry. That’s odd, I thought, that regiment was never anywhere near Colorado during the war. No one in the car was honking the horn yet, so I decided to look at a few more of the headstones. My luck being what it is, two headstones later I came across a former member of the 6th U.S. Cavalry. It was nearly halfway into the earth, with the unit nearly obscured by the grass. 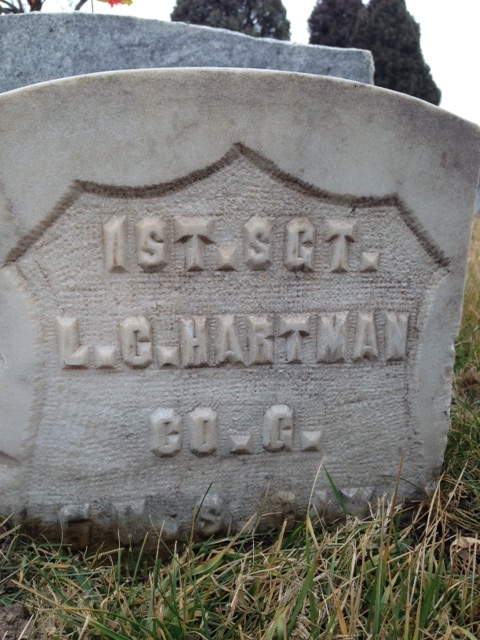 First Sergeant Louis C. Hartman, Co. G, 6th U.S. Cavalry. “Why on earth is he here?” I wondered. In the course of our research for our book on the regiment during the Civil War, my co-author and I came across former members of the regiment buried all over the country. There’s even one in an unmarked grave in Cripple Creek who apparently died there as an old man during the gold rush, but Pueblo seemed an odd spot to find one. After the war the regiment served in Texas and later in Arizona against the Apache Indians, but to the best of my knowledge the unit never passed through Pueblo. I vaguely recalled a Hartman or two from our regimental roster, so I took a couple of pictures of the headstone and hurried back to the car. “What did you find?” my wife asked. “A guy from the 6th Cav,” I replied. I scribbled myself a note on one of my omnipresent 3×5 cards and resolved to look into the matter once we got home. Louis was a bit more difficult about the matter than I expected. I checked the roster in our book, and discovered that while two Hartmans served in the regiment during the war neither was named Louis or assigned to Company G. A bit more searching revealed at least part of the man’s story. Louis C. Hartman enlisted in Company C, 78th New York Infantry as a private on November 8, 1861. He was born in Berlin, Prussia in 1841, and worked as a clerk prior to his enlistment. Company C was one of three raised in New York City. They were originally intended to be part of the 1st Regiment, Eagle Brigade, but merged with the Lochiel Cameron Highlanders to become the 78th New York Infantry in New York City on April 26, 1862. The regiment shipped out a few days later. After a brief stay in the defenses of Washington, they were assigned to Harpers Ferry. Its first major engagement was at Cedar Mountain, followed by Antietam, Chancellorsville and Gettysburg. It was transferred to Tennessee in October 1863, and fought in numerous engagements around Chattanooga that fall and winter. The following spring it fought under General Sherman in the advance on Atlanta at Resaca and around Kennesaw Mountain. On July 12, 1864, due to depleted ranks, the 78th’s remaining soldiers were transferred to the 102nd New York Infantry, where they completed the remainder of their enlistments. They had nearly completed Sherman’s march to the sea when Hartman was discharged as a sergeant at the expiration of his enlistment on November 8, 1864. Louis returned to New York City, but didn’t stay long. Despite a very impressive service record, he apparently had not yet seen enough of war. 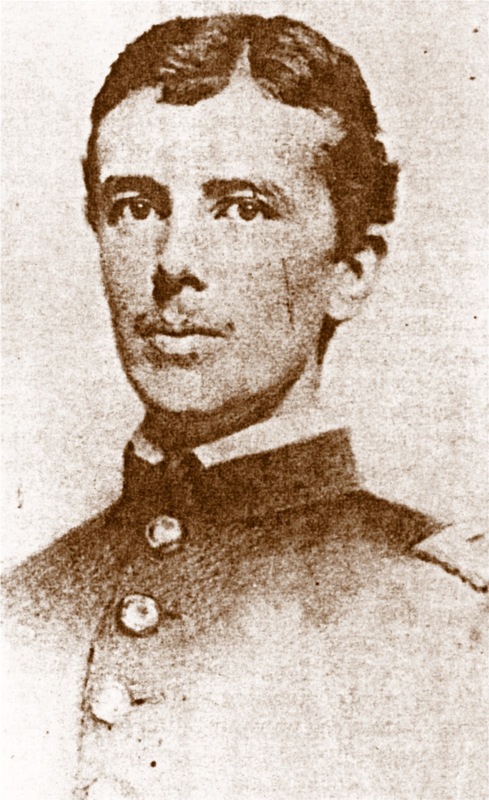 On December 1, 1864, he enlisted as a private in Company K, 18th New York Cavalry in New York City. His muster card describes him as 5’10” tall, with brown hair, brown eyes and a fair complexion. He joined the regiment in the field in Louisiana, and served there and in Texas until the company mustered out in Victoria, Texas on May 31, 1866. Not until 1868 did Louis Hartman join the 6th U.S. Cavalry. He was enlisted into Company G by Captain Tullius C. Tupper, the regiment’s former sergeant major, on June 3, 1868 in New Orleans, Louisiana. With his wartime experience, it is not surprising that he rose quickly through the ranks and was the company’s first sergeant when his enlistment expired in 1873. He re-enlisted into the same company on June 10, 1873 at Fort Dodge, Kansas, and was still the first sergeant when his second tour expired in 1878. He re-enlisted in the company a third time at Camp Grant, Arizona Territory on June 10, 1878. He was discharged the following year by Special Order 277 of the Adjutant General’s Office. He was a sergeant vice the first sergeant, but his service was characterized as excellent so it was most likely not a disciplinary issue. It isn’t clear what Louis did for the next several years, as the next time he surfaces is in 1884. He filed a pension claim as an invalid on January 2nd in Kansas. On June 30th, he joined Lewis Post No. 294 of the Grand Army of the Republic in Dodge City, Kansas. He claimed his service in the 78th New York as his basis for GAR membership, but listed the 78th New York, the 18th New York and 6th U.S. Cavalry on his pension application. The following year Hartman moved to Pueblo, Colorado. According to the state census, he was boarding at the home of Benjamin Ott while working as a bookkeeper in Pueblo on June 1, 1885. He married soon after. I could not determine the date of his death, but his widow Lizzie submitted a pension claim on July 25, 1894. Craig, I apologize. After seeing the headstone, I forgot all about the cannon, but I’ll get a picture when I return there later this week. This section of Roselawn Cemetery isn’t overly large, but I suspect there are more Civil War stories there. Carter, W.H. From Yorktown to Santiago with the Sixth U.S. Cavalry. Austin: State House Press, 1989. Kansas G.A.R. Bound Post Records, 1866-1931, Lewis Post No. 294, June 30, 1884. Accessed on Ancestry.com on February 1, 2015. Phisterer, Frederick. New York in the War of the Rebellion, 3rd. ed. Albany; J.B. Lyon Company, 1912. The third and final Barr letter discusses the Confederate shelling of the cavalry camps between Westover and Harrisons Landing on July 31, 1862. While I’ve seen several accounts of the incident that we included in our book, I don’t recall an account of the punitive expedition that crossed the river afterwards. Burning every house sounds like a bit of exaggeration. It seems unlikely that this would be Barr’s last letter to the paper over the next two years of his enlistment. At a minimum I would have thought the band’s detachment from the regiment and attachment to Pleasonton’s headquarters would have drawn comment. I haven’t been able to locate any additional letters, however. Again I send you a few items of news, which I hope will be interesting to your readers. War news have been a little below par with us for some time. On the night of the 31st of July, at about twelve o’clock, we were aroused from our peaceful slumbers by the booming of artillery. We turned out of our tents in “double quick,” and found the shot and shell coming into our camp as thick as hail. The Rebels had opened on us from the other side of the river, from five different points. Every person was taken by surprise. Soldiers and civilians were seen flying in every direction, filling up every safe place that could be found. Some were in groups behind bales of hay, while others were behind trees; the firing was kept up for an hour, when they were finally compelled to retire, no doubt by the appearance of two or three gun-boats, which threw a few hundred pound shells in among them. The only damage done in our camp was one horse killed, some few tents ripped, &c.; what was done to other camps I have not been able to hear, but it is supposed to be slight. At 6 o’clock P.M., August 1st, two or three regiments of infantry, cavalry, &c., were landed on the other side of the river, just opposite our camp. They had not been there many minutes until every house on the river bank was burned to the ground, the burning timbers and stone chimneys coming down with a crash. The yelling of the soldiers could be heard for miles. Today, August 4th, we have news from the other side of the river of the capture of some few prisoners, five pieces of artillery, and the destruction of a rebel camp. Soldiers could be seen marching up and down the banks with turkeys, chickens, geese, &c., suspended from their bayonets. Col. Tyler’s battery of five siege guns are now planted on the river bank, about two hundred yards in rear of our camp, which I think, will send them to the last hole if ever they try it again. All is quiet at present along the river, the only enemies we have to contend with now are the flies and mosquitoes; they march in upon us in whole brigades, while “Old Sol” comes down with a vengeance. I am told that “Bowery” is coming out with a company. Michael, can’t you manage to send a keg of lager with him; and let him stop at the quarters of the 6th U.S. Cavalry Regimental Band? He will find the happiest set of boys he ever beheld. Oh, whew! But it’s hot! And our friend Lewis Trodenick, is sweating as much as any of us. Lewis is as jolly as ever, and has come to see the sights.